According to the Ontario laws, every business owner has to conduct fire inspections to keep their customers, employees, and properties safe from fires. If you are looking to undertake a fire inspection, here are some tips that will make your next encounter with the fire department guys a pleasant one. Following these tips will make sure you are on the right side of the law every time you have a fire inspection. 1. 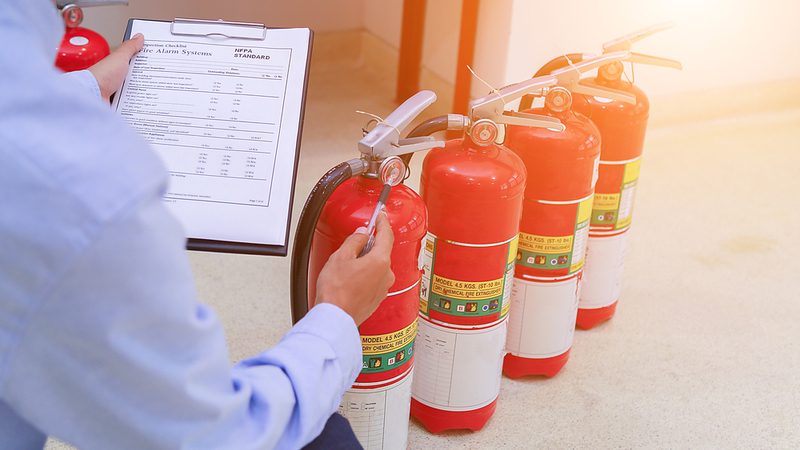 Keep your fire extinguisher fully charged and visible: One of the main things inspectors will look out for is whether your fire protection Toronto system includes fire extinguishers. Make sure all your fire extinguishers are visible, fully charged, and easy to access in case of a fire breakout. Extinguishers must also undergo annual servicing and monthly inspections, done by a skilled technician. 2. Ensure your sprinkler systems have undergone the required maintenance: It is paramount that you confirm that every part of your sprinkler system is working properly if you want to avoid trouble during the fire inspection department. Fire sprinkler systems maintenance includes making sure all sprinkler heads are intact. 3. Test your smoke alarms annually: Every year, you will need to change the batteries of your smoke alarms as part of inspection preparation. This will help you avoid a scenario where an inspector tests a smoke alarm and you both realize it has not been working. 4. Bring in CFFA-licensed technicians: Due to their training and expertise, these technicians will be able to conduct thorough inspections that ensure all your safety systems are up to standard before a scheduled fire inspection. 5. Make sure you have an exit signage that is fully illuminated and clearly visible: Also confirm that the locks on your exit doors are fully functional and that one does not need special codes to access the exit passageways. The inspectors may also check to see if your passageways are clear enough. 6. Avoid electric hazards: One way to do this is by avoiding circuit overload. Also, ensure that you don’t simultaneously use your electrical solutions such as electrical cords and power bars. 7. Organize and clean your laundry room and keep the storage rooms bare: Regularly have all the lint build up cleaned out from your laundry machines and look out for misplaced clothing items in the laundry area. Furthermore, make sure that your service and mechanical rooms are clean with no clutter lying around. 8. Ensure that your emergency power source (generator) is properly maintained and serviced. 9. Perform pipe flush and flow tests: It is advisable that you ensure your pipes are in good condition by performing tests every five years. 10. Update your fire plan: Amend your fire plan to incorporate changes occurring in your premises year after year. You also ought to have a fire safety box where you store the fire plans and previous annual fire inspection reports. By following the above ten tips you are sure to have successful fire inspections every year.